My kind of soul food. Firstly, cook your pasta in a pot of salted boiling water and two minutes before it’s done, throw in the cavolo nero as well. After the two minutes, drain your pasta and greens and run them under cold water to stop the pasta and cabbage leaves from cooking further. Drain and set this aside. In your saucepan, add a good pinch of sea salt to your pan and add your oil and butter. Heat your oil and butter and on a medium heat, gently fry the garlic until it’s golden brown, spooning the butter/oil over your garlic continuously. Throw in the chillies, fry them for a few seconds and then toss in your mushrooms. After no more than 30 seconds to 1 minute of frying your mushrooms, throw the tomatoes in. The tomatoes will start releasing their juices and begin to soften within 30 secs. 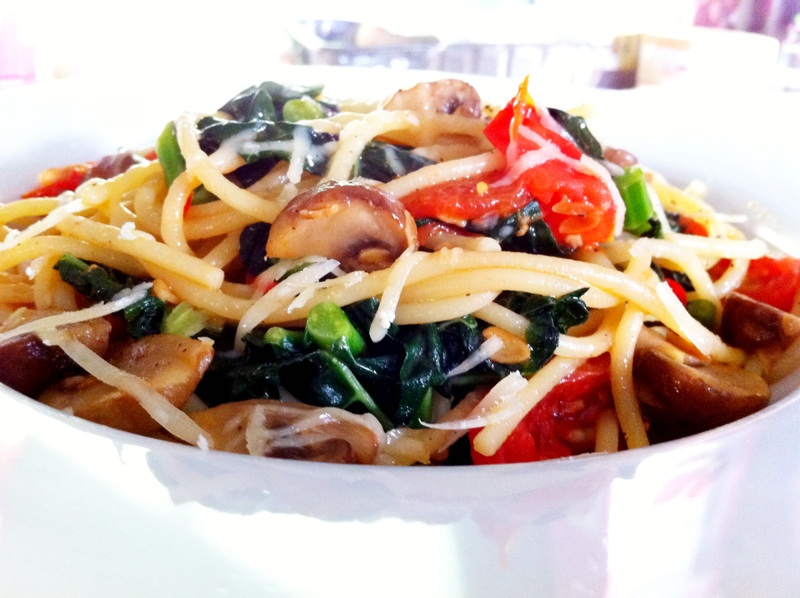 Toss your pasta and cavolo nero into the mix, and stir for 1 minute. Pour your pasta into your dish and grate some parmesan or pecorino cheese over the top. You’ll find the pasta will have turned slightly pinkish from absorbing the liquid from your pot (that’s all the juices from the mushrooms, oil, chillies and tomatoes), while your plum tomatoes have softened to become almost like a sauce for your pasta. I also think this dish would be lovely if you add a squeeze of lemon or a few kernels of toasted pine nuts. You might need a bib because if you eat this as quickly as I did, there’ll definitely be slurp marks on your clothes. LOL.